Water vapor is water in its gaseous state-instead of liquid or solid (ice). Water vapor is totally invisible. If you see a cloud, fog, or mist, these are all liquid water, not water vapor. Water vapor is extremely important to the weather and climate. Without it, there would be no clouds or rain or snow, since all of these require water vapor in order to form. All of the water vapor that evaporates from the surface of the Earth eventually returns as precipitation - rain or snow. Water vapor is also the Earth's most important greenhouse gas, accounting for about 90% of the Earth's natural greenhouse effect, which helps keep the Earth warm enough to support life. When liquid water is evaporated to form water vapor, heat is absorbed. This helps to cool the surface of the Earth. This "latent heat of condensation" is released again when the water vapor condenses to form cloud water. This source of heat helps drive the updrafts in clouds and precipitation systems, which then causes even more water vapor to condense into cloud, and more cloud water and ice to form precipitation. Water Vapor Cools AND Warms the Climate System? 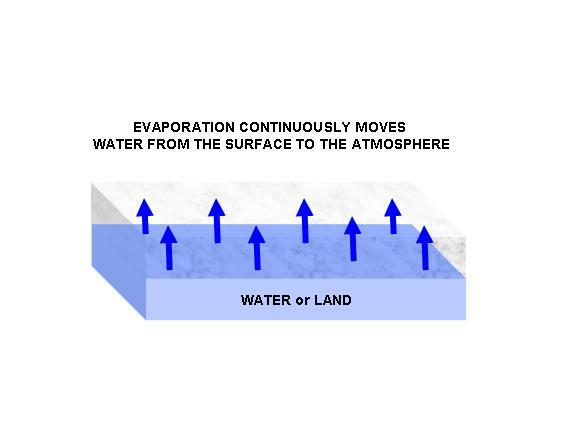 When water evaporates from the surface of the Earth, it cools the surface. This keeps the surface from getting too hot. But because that water vapor is also the atmosphere's primary greenhouse gas, water vapor acts to keep the Earth's surface warmer than it would otherwise be. So which effect is stronger, water vapor's cooling effect or warming effect? Interestingly, it is seldom mentioned in the global warming debate that the surface cooling effect of evaporation (which creates water vapor) is stronger than its greenhouse warming effect.